The results from the annual Christmas shopping survey for Twenga, the shopping search engine, show that 52 per cent of Brits don’t want to receive a 3D TV for Christmas. Although the Germans and the Dutch agree with the Brits, the French (57 per cent), the Italian (69 per cent) and the Spanish (61 per cent) would like to find a 3D TV under their Christmas tree. 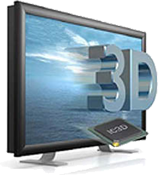 One of the main reasons they see for not being offered a 3D TV is the price: 32 per cent of Brits and 48 per cent of the Spanish find it too expensive.